A year later than it was supposed to, Cardiff belatedly said goodbye to the FA Cup final. And in what majestic style, too, with a game that will go down as one of the greatest in the competition's 134-year history. It was set up perfectly: a classic Cup final between favourites and rank outsiders, between one of the aristocrats of the English game and one of its most famous underdogs. Whatever the eventual outcome, the West Ham fans had decided early on they were going to have a day out to remember as they turned Cardiff city centre into an East End carnival. They got to the stadium early too, keen to soak up every last drop of atmosphere as they returned to the venue of their Championship play-off triumph in 2005. And with less than half an hour gone, the Millennium Stadium looked set to witness the biggest Cup final shock since Lawrie Sanchez glanced past Bruce Grobbelaar and Wimbledon beat Liverpool in 1988. The stadium was rocking as well. Both goals were gifted to Alan Pardew's side by woeful Reds defending, but it did not matter how they came - the Londoners were suddenly 2-0 up and preparing to party. The wave after wave of claret-and-blue that engulfed half the ground was in collective dreamland. The red half had barely even broken into song as they were mimicked and taunted by their less illustrious rivals. The first sign there were any Merseysiders in the house came courtesy of their first goal, a sumptuous Steven Gerrard pass and a superbly-executed Djibril Cisse volley finally livening them up. When Gerrard's first moment of genius arrived soon after the break, you could have forgiven the Hammers fans for thinking their luck had run out. But they were relentless, standing up for the entire second half and singing as if their lives - and their team - depended on it. Meanwhile on the pitch, it was turning into one of those old-fashioned black-and-white Cup finals. You know the ones: where one team scores, then play cuts to the other end and the other team replies and that's all you get to see. When Paul Konchesky's left-wing cross sailed in to provide Jose Reina with his second calamitous moment of the afternoon, it seemed as though the Hammers' persistence was going to prevail. But as the clock ticked into injury time and the ball fell at Gerrard's rifle-like right-foot 30 yards out, time stood still. When it moved again, the ball was in the top corner of Shaka Hislop's net and it was all to play for again. I'll let you into a secret: this was my first FA Cup final. I'd watched every one on television since the age of five, and to be honest, I wasn't that keen. FA Cup finals seemed to always flatter to deceive, to offer more in the build-up than in the 90 minutes of flat, laboured action where the favourite wins 2-0 and everyone goes home having done their job. I started out a neutral, keen to see a game worthy of the setting more than anything else, and West Ham above all ensured I was not disappointed. I shared some of their angst when Reina redeemed himself with a wonder save to tip Nigel Reo-Coker's header onto the post, and could barely believe my eyes when Marlon Harewood hopelessly sliced the rebound wide. But it was not to be, and when Anton Ferdinand saw his penalty saved in the shoot-out, Liverpool had their name on the famous trophy once again. Unlike the West Ham fans, I could not be disappointed. 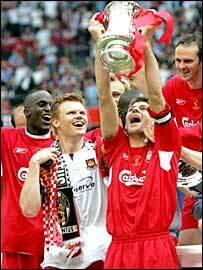 If I watched another 100 FA Cup finals, surely none would rank higher than this.